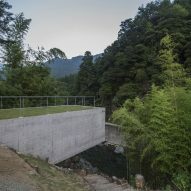 Masato Sekiya's firm Planet Creations has completed a concrete weekend house, which cantilevers six metres over a rocky ledge in Japan's Omine mountain range. 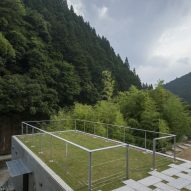 Located in Tenkawa village, 600 metres above sea level, the site is surrounded by the Omine mountain range. 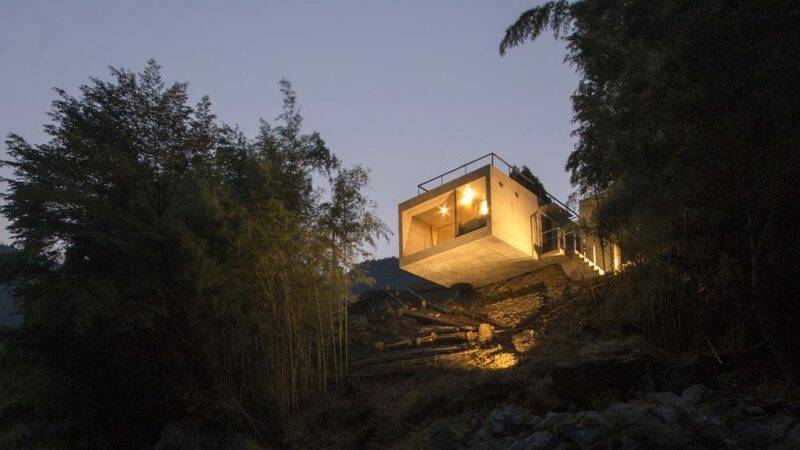 The house, which was designed as a holiday villa for a doctor and his wife, protrude out from the cliff edge above a river – a spot where the couple enjoy practicing a type of fly fishing called ayu. 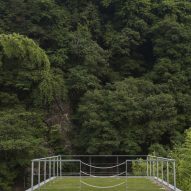 Described by the architects as "a space floating in nature", the building's lofty perch provides it with spectacular views across the forest and the Ten River, which is 17 metres below. 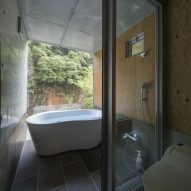 "Even in the initial stage of planning, when the owner suggested that he would be satisfied with a simple fishing cabin, I perceived difficulties," explained Tokyo-based architect Masato Sekiya. "A large percentage of the site was a steep slope inclining 17 metres toward the Ten River, and the flat area was only six metres square, so once parking for two cars was established, there was no room for a building." Faced with the possibility that the sharply inclined riverbank could collapse or the water could rise, the suggestion of setting a tall pillar on the shore to support the residence was deemed too dangerous. The building's tubular reinforced concrete structure is installed on flat bedrock, with a concrete pillar as a fulcrum, and a mass of concrete as a counterweight. The practice also explored the possibility of constructing a two-floor structure beside the road, with parking on the first floor and a residence on the second, however, Sekiya concluded that the tall building would ruin the scenery. 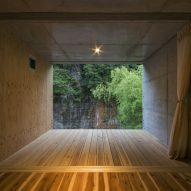 "My solution was to dig down nearly to the bedrock and sink the building into the ground, then extend it out into the air over the river," said Sekiya, who named the project Cliff House. "As a result, we created a six-metre cantilever with a tubular reinforced concrete frame [measuring] 5.2 by 2.5 meters, and we were able to secure sufficient internal space." Inside, the plan is partitioned lengthways with the spare bedroom, kitchen, laundry and bathroom located on one side, and the master bedroom, living room and deck area on the other. The end of the building that extends outwards is open, framing views across the river. "The area most needing light is the deck area, the next is the living/dining room and last is the bedroom, so they are arranged in this order," said Sekiya of the layout. "Each area is separated by sliding doors that can be folded back completely, and by opening the sliding doors, the view of the green landscape flows through to the bedroom." Seeking to make minimal impact on its surroundings, the sunken house's roof becomes a lawn, which is all that can be seen from the road. Sekiya's holiday home is among a number of buildings published on Dezeen that cantilever over a cliff edge. Earlier this year OFIS Arhitekti released a movie of a tiny Alpine cabin that was helicoptered into its precarious mountain-top position, while a mountain restaurant by architects Peter Pichler Architecture and Pavol Mikolajcak features a trio of glass-fronted gables that overhang a ledge in the South Tyrolean Dolomites. Photography is by Akira Kita.